When I think of city trips I usually think of museums, culture, history, restaurants, theaters, concerts, architecture and many other things. I never would have thought of wild animals in terms of a city trip. Neither have I thought of wild animals in Vitória – in the Brazilian state Espírito Santo. 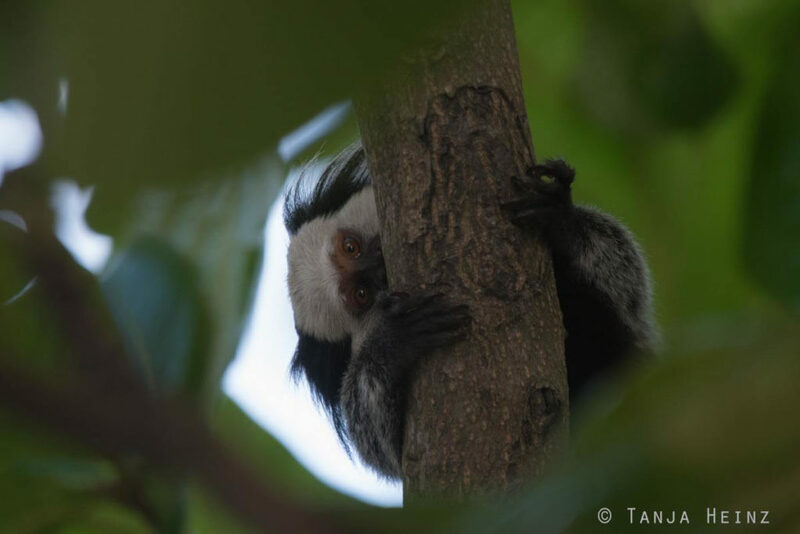 After meeting crested capuchins in the Reserva Natural Vale close to Linhares – as well in Espírito Santo – I was still daydreaming about my encounter and actually had no special wish for Vitória with respect to wild animals. 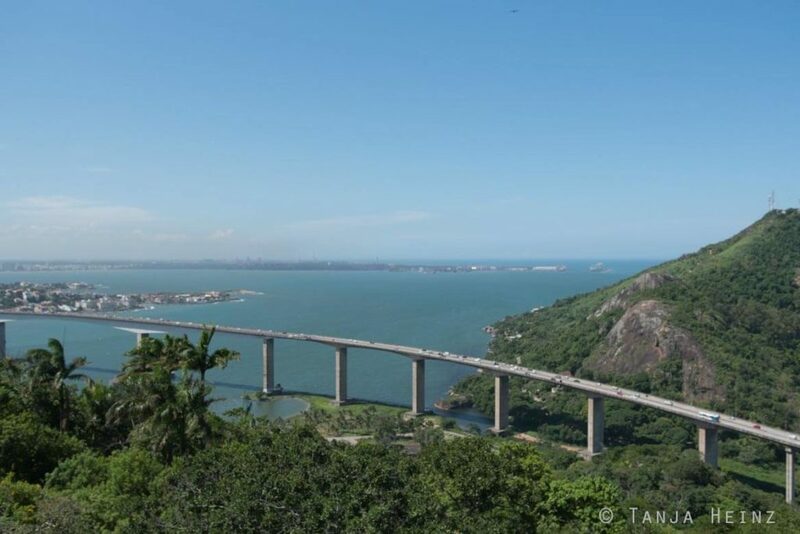 Of course after visiting the Projeto TAMAR in the Reserva Biológica de Comboios I wished to see the Projeto TAMAR in Vitória. Needless to say, we did. But in the first moments in Vitória I was content without any special plan to see wild animals in the big city. I was just content and happy. However, when our Airbnb host told us that little monkeys live on the Morro da Penha, she made my heart jump for joy. I started to ask questions in Spanish mixed with a few Portuguese words. 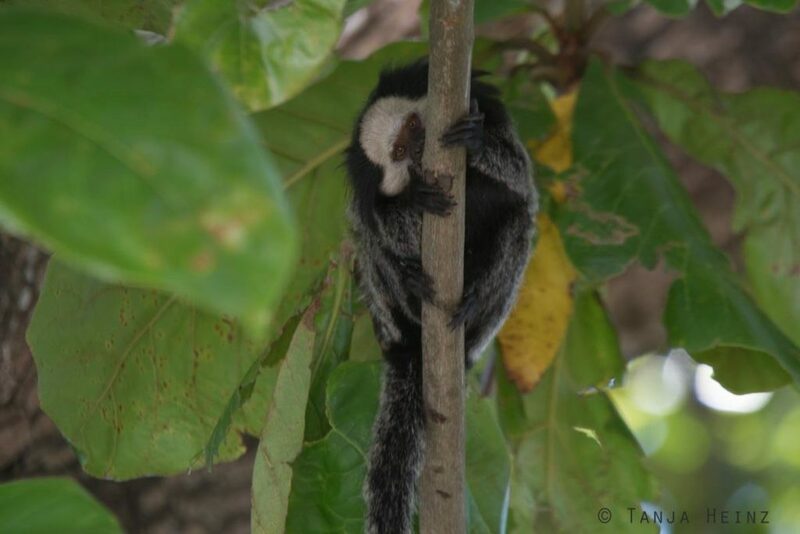 Which little monkeys live on the Morro da Penha? How can we get to the Morro da Penha? 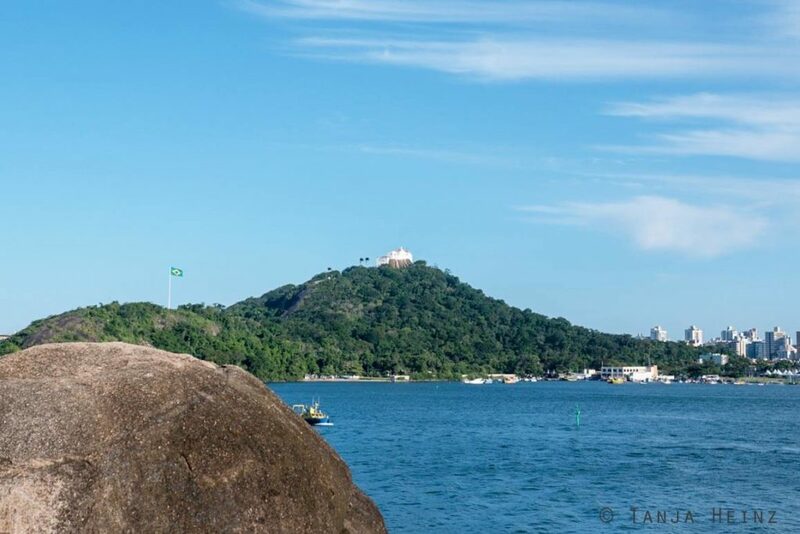 Where can I observe the littel monkeys on the Morro da Penha? If I wouldn’t have travelled with Ricardo, this conservation would have been more difficult. He translated from Spanish to Portuguese and back from Portuguese to Spanish. Fortunately, our sympathetic Airbnb host took time for us to explain how we can get to the Morro da Penha to observe the little monkeys. Fortunately, we had to walk only a small distance from our accomodation to the next leaving bus. But as there was no direct bus to the Morro da Penha, we had to change the bus twice. By the way, when using public transport in Brazil it is very useful to know some Portuguese. Things are much easier and you might reach your destination earlier. 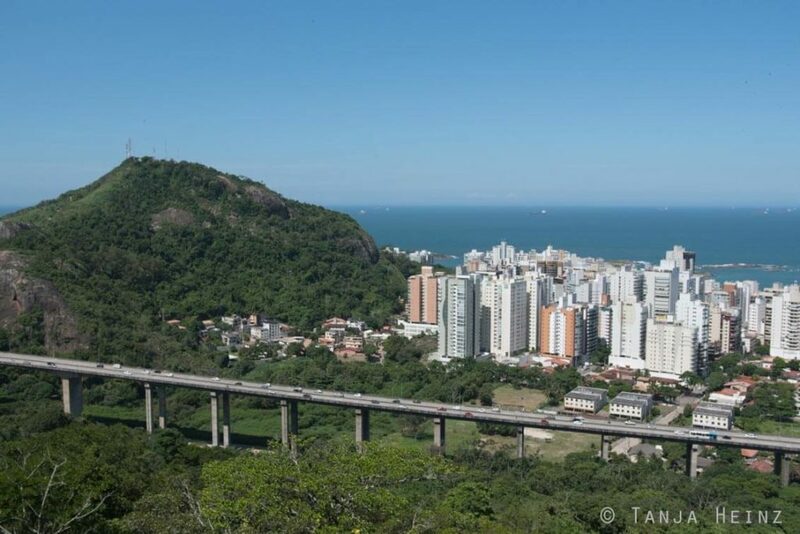 The Morro da Penha (english: morro = „hill“, penha = „rock“) is actually not in Vitória but in Vila Velha. I have to admit that I was not aware about that before I went to Vitória. When I was on the Morro da Penha I thought that I’m still in Vitória because Vila Velha, and thus, the Morro da Penha are located like Vitória at the Baía de Vitória. However, just on the other side of the river. Well, I really could have informed myself much better before visiting Vitória and Vila Velha! Now I know it and I have seen the little monkeys anyway. Be it Vitória or Vila Velha in that moment I wouldn’t have cared about that. I want to emphasize here as well, that Vila Velha was the first colony in Espírito Santo by the Portuguese. 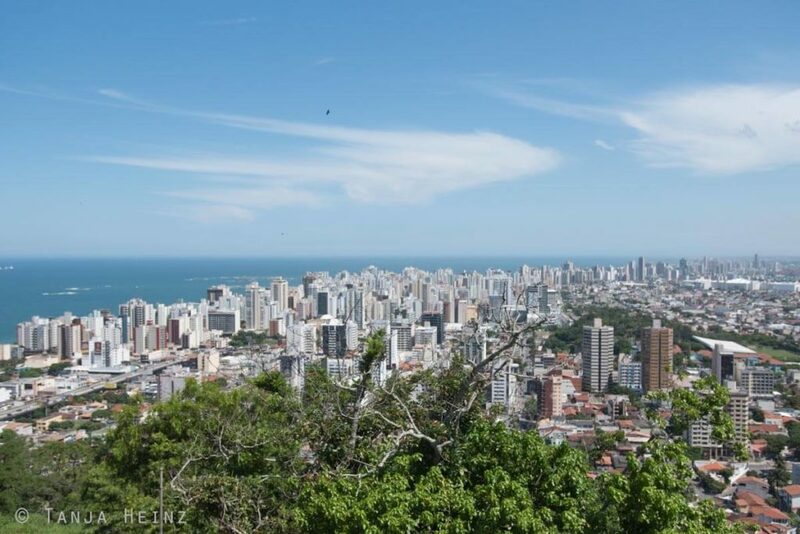 Thus, Vila Velha is the oldest city in the state. 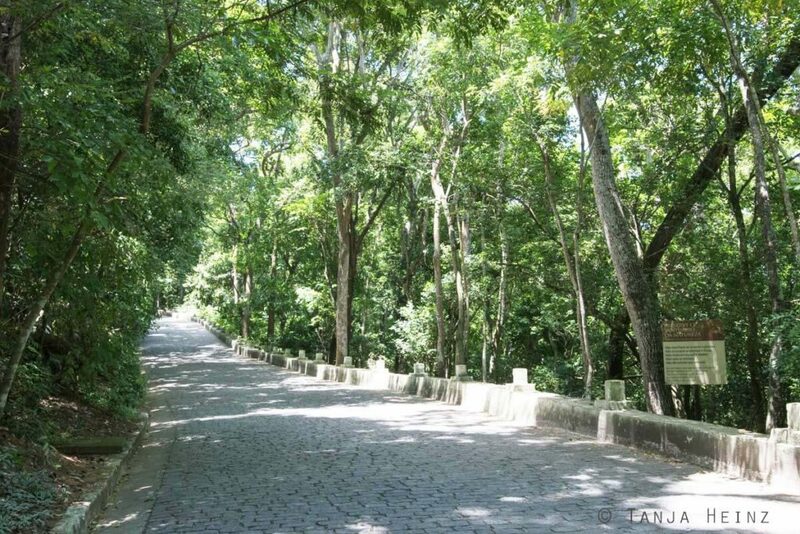 Nevertheless, I was thankful when I saw the entrance of the Morro da Penha when we got off the bus, because the Morro da Penha is a densly forested area where a cobbled street leads to the Convento da Penha (English: “convent”). As the Brazilian sun was quite hot sometimes, I was often very happy to spot some shade like it was the case when I saw the entrance of the Morro da Penha. Therefore, our walk up the Morro da Penha was very pleasant for me. 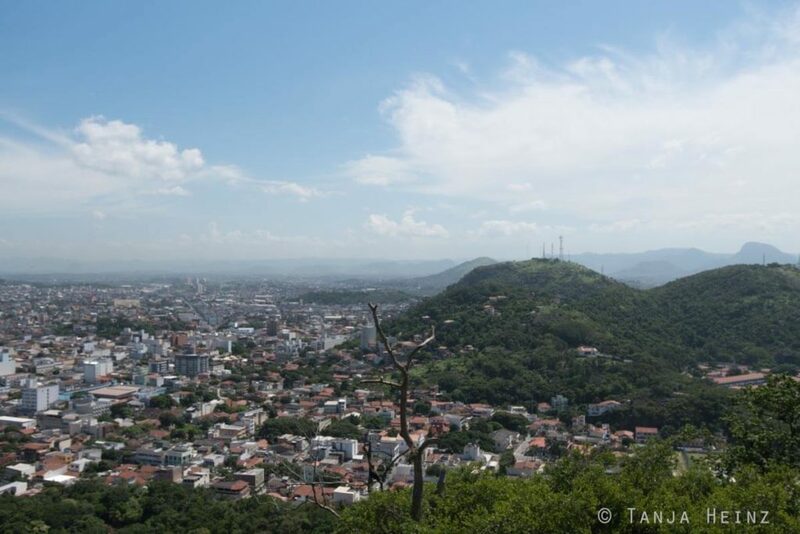 By the way, Morro da Penha is an important pilgrimage site for religious people, because on the top of the Morro da Penha is the convent Nossa Senhora da Penha. This also means that during Easter time the convent is well-frequented – like Ouro Preto as well. When we walked up the Morro da Penha we did not see any little monkeys. We did not see many birds, neither. It was still in the morning but already very warm. 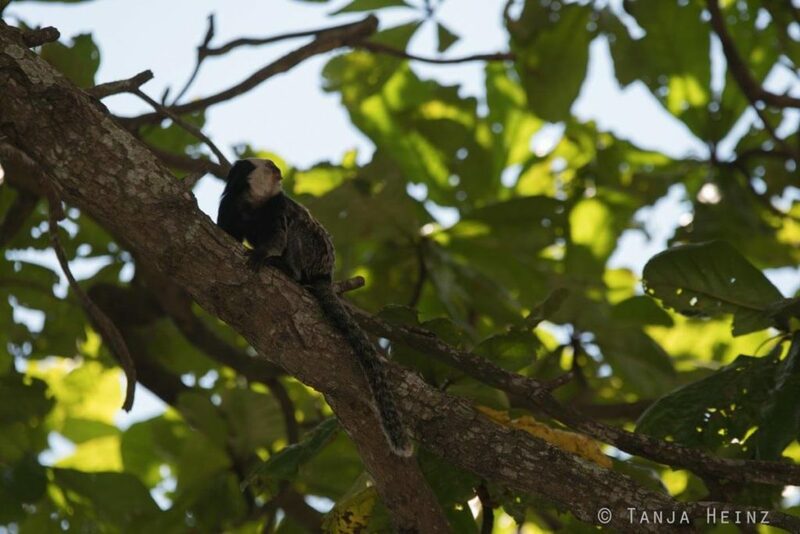 I was still in high spirits and I was anyhow sure that I will see little monkeys on the Morro ea Penha on that day. 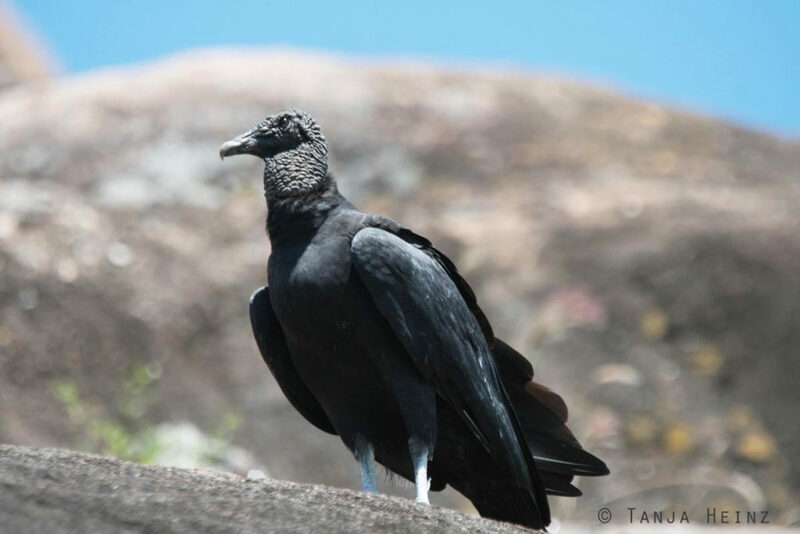 When we arrived at the top of the Morro da Penha the first animals we encountered were black vultures (Coragyps atratus). Of course when we arrived at the Morro da Penha we immediately saw the Convento Nossa Senhora da Penha. 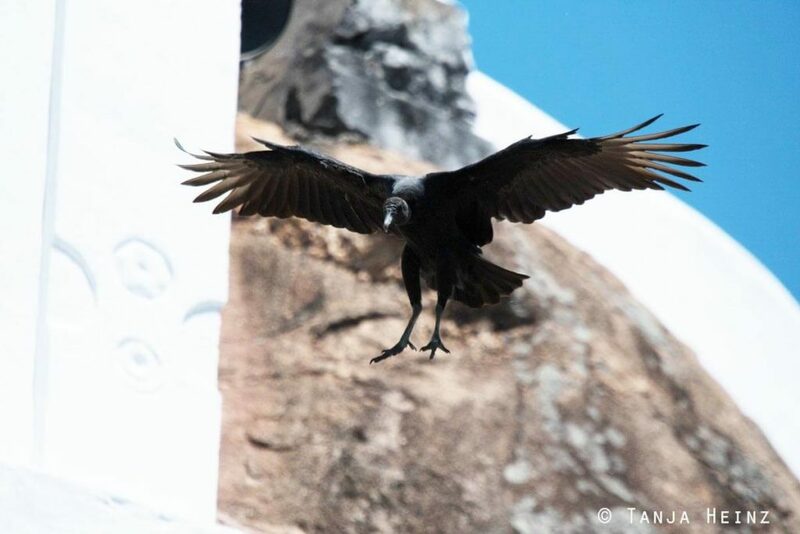 Around the convent we observed continuously black vultures alighting and leaving again. In the vicinity of the convent Nossa Senhora da Penha was a small café with a souvenir shop. There is also a platform with an amazing view over Vitória. 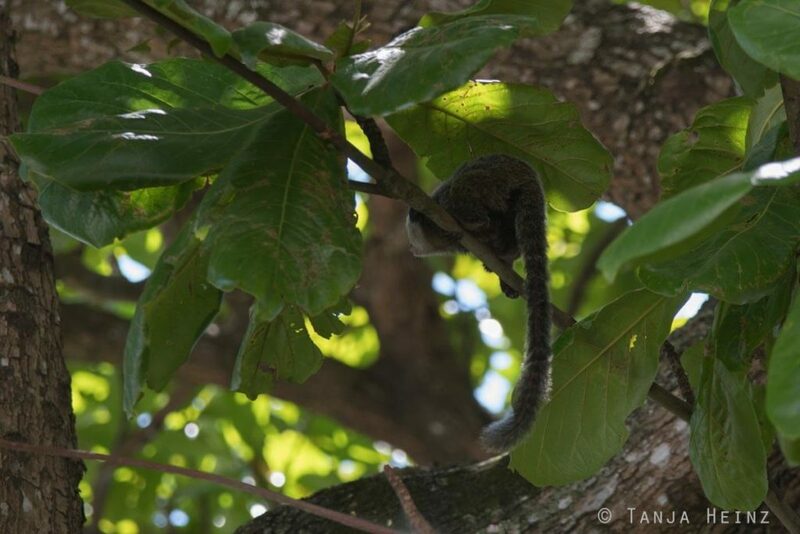 Naturally I looked for little monkeys in every tree I encountered. 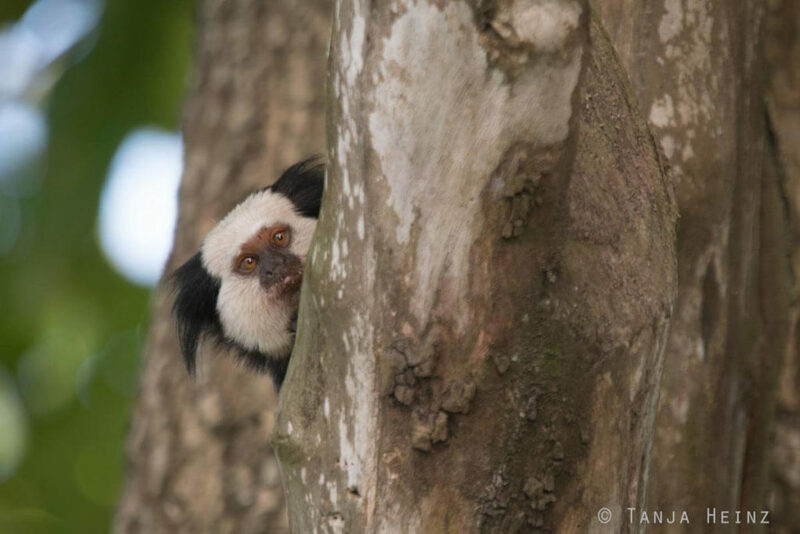 Where are the little monkeys? As we were searching for the little monkeys close to the café in vain, we walked into the direction of the entrance of the convent Nossa Senhora da Penha. 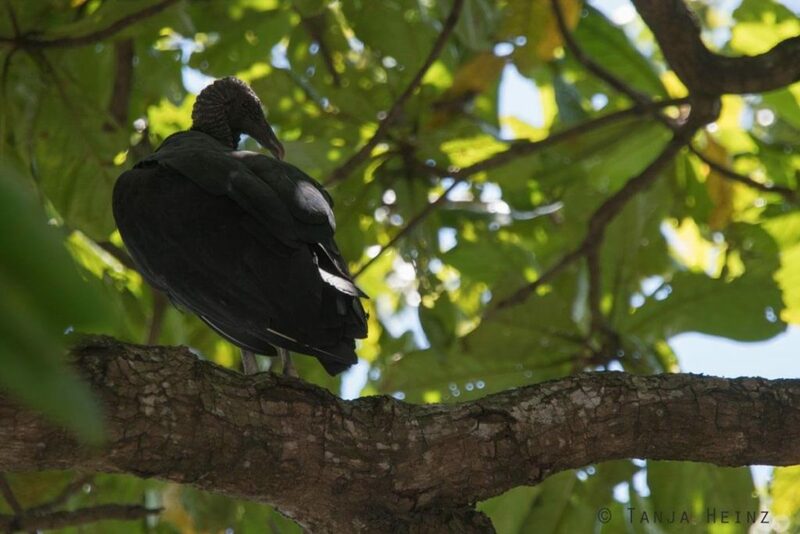 Of course we spotted a black vulture again in one of the trees around the Convento da Penha. When I was looking more around I spotted a long ringed little tail. 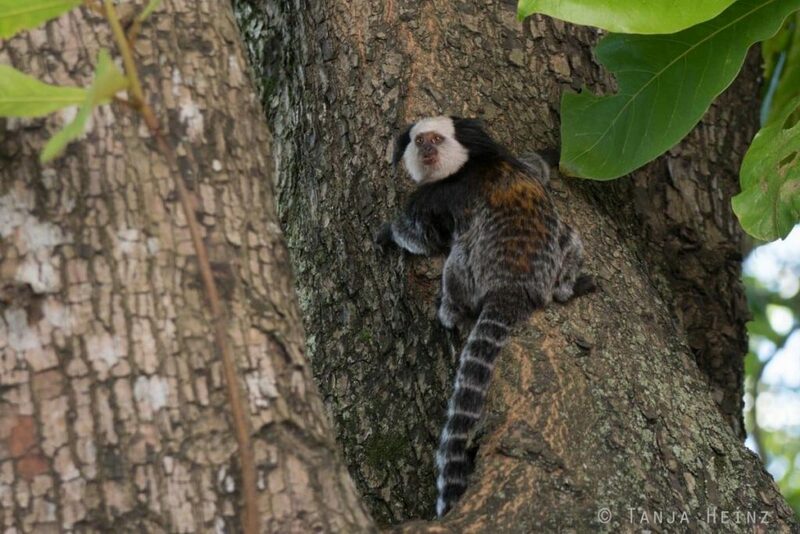 I spotted a Geoffroy’s marmoset! Although I had already observed two for South America typical monkey species, that is the black capuchin (Sapajus nigritus) in the Feliciano Miguel Abdala Natural Reserve and the crested capuchins (Sapajus robustus) in the Reserva Natural Vale, I was more than happy to count a third species to my observations. Black capuchins and crested capuchins belong to the family Cebidae that comprises two subfamilies. And that is capuchin monkeys (Cebinae) (including black capuchins and crested capuchins) and squirrel monkeys (Saimiri). 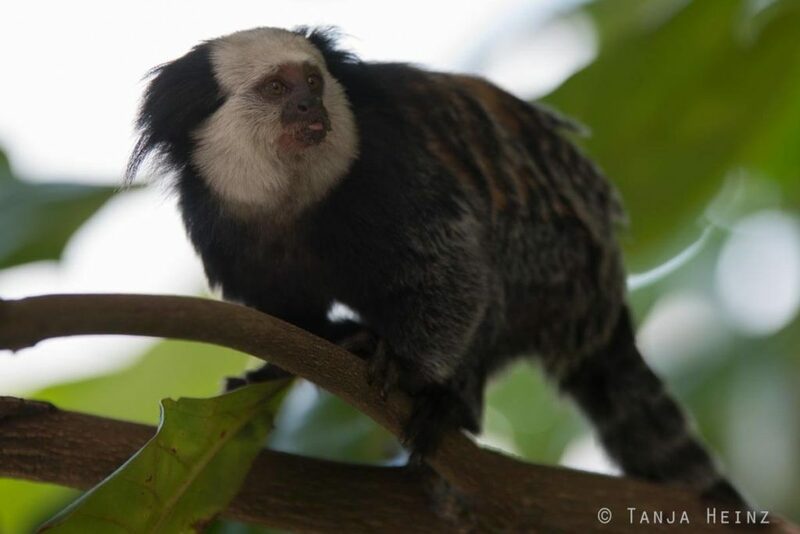 The Geoffroy’s marmoset, in contrast, belongs to the family Callitrichidae including marmosets and tamarins although sometimes they are regarded as the subfamily Callitrichinae of the family Cebidae. 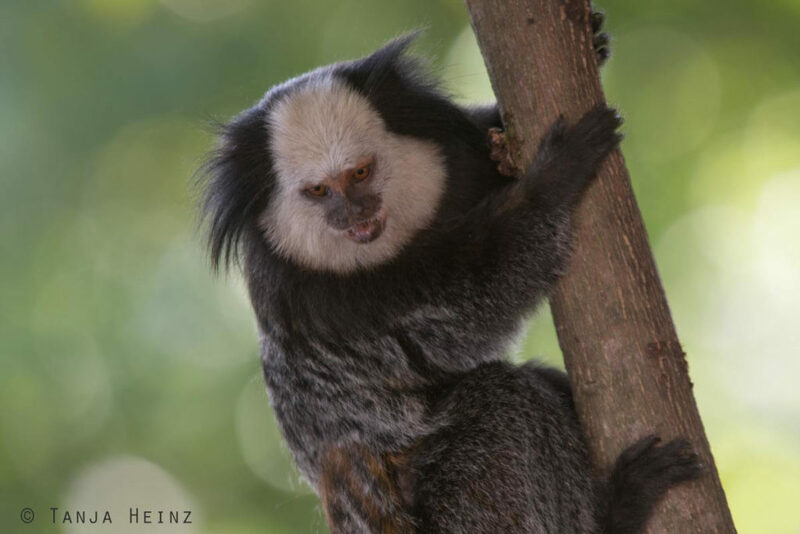 Nevertheless, Geoffroy’s marmosets and capuchin monkeys have definitely one thing in common. All of them belong to the New World monkeys (Platyrrhini). That means they belong to the monkeys of the New World, that is America. 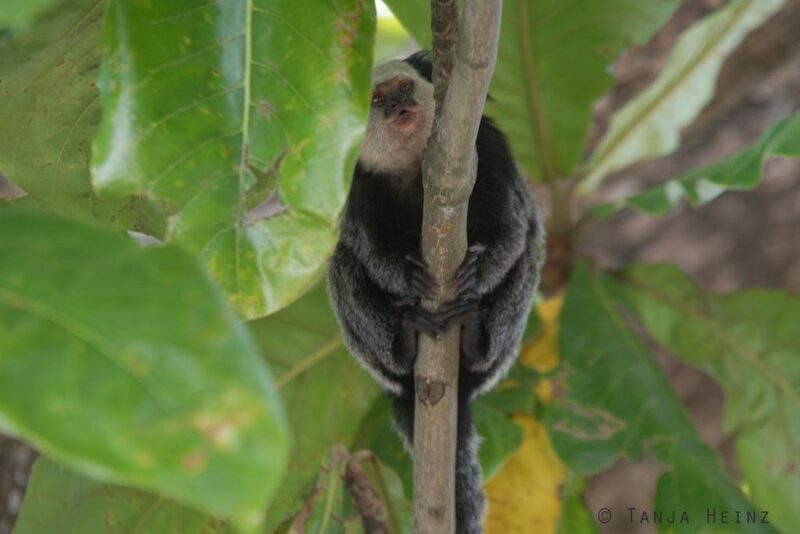 However, not only the two families Cebidae and the Callitrichidae belong to the New World monkeys. There are three more families. That is the night monkeys (Aotidae), the titis, sakis and uakaris (Pitheciidae), but also the howler, (woolly) spider and woolly monkeys (Atelidae). Before I met the Geoffroy’s marmosets I was already on a search of a woolly spider monkey. And that was in the Feliciano Miguel Abdala Natural Reserve where I was looking for the Northern muriqui. Unfortunately, I was not successful with my search. However, in the course of my journey through the South of Brazil later I would meet woolly spider monkeys. Not the Northern but the Southern muriquis. Howler monkeys as well belong to the family Atelidae like the woolly spider monkeys. I met howler monkeys in the Brazilian Pantanal. As there are New World monkeys, there are also Old World monkeys (Catarrhini) of the Old World (Eurasia and Africa). Humans as well belong to the Old World monkeys. 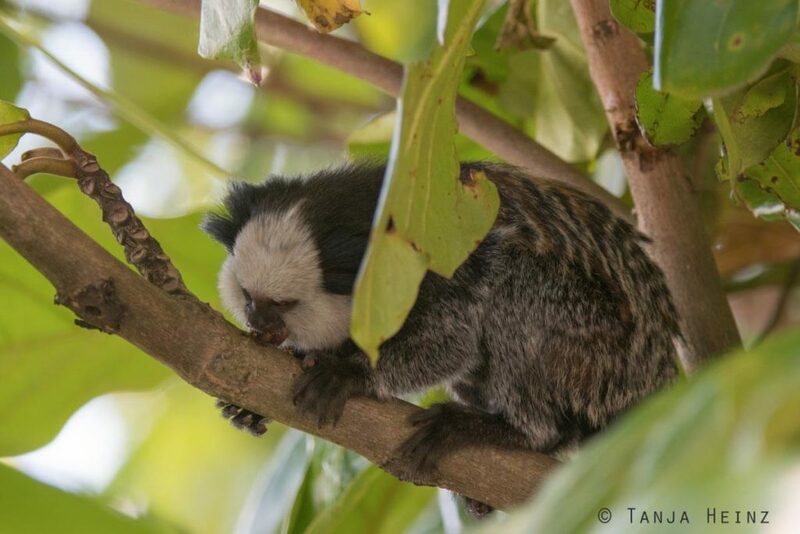 Vervet monkeys or langurs are more examples of Old World monkeys, but also baboons and gibbons. Maybe all this sounds a little bit complicated. However, I always find it quite interesting to which animal group a species belongs, because New World monkeys are flat-nosed with sideways-facing nostrils. In contrast, nostrils of Old World monkeys point downwards. 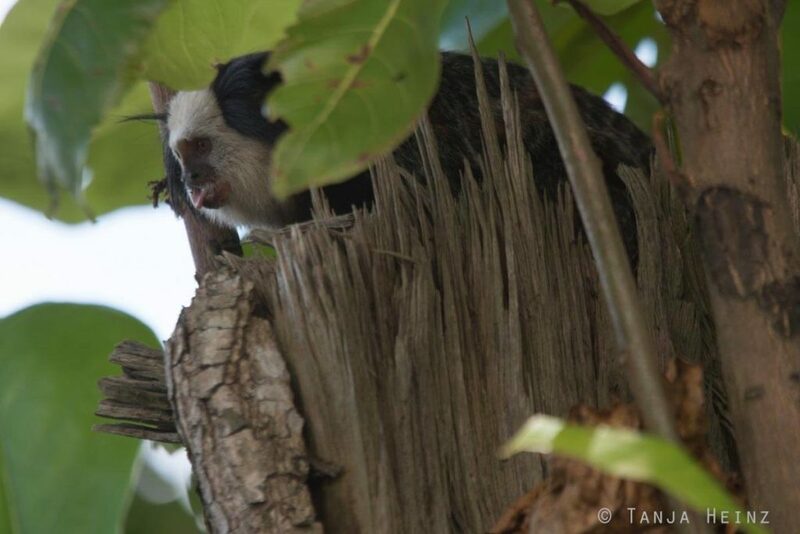 So this means that Geoffroy’s marmosets possess flat noses and nostrils facing to the side. Is this species endangered or not? 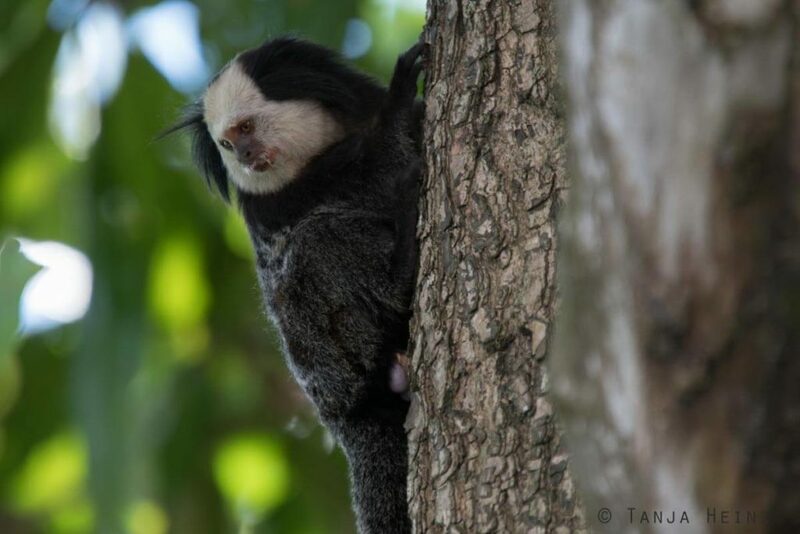 With respect ot Geoffroy’s marmoset I can say: No, they are not endangered. 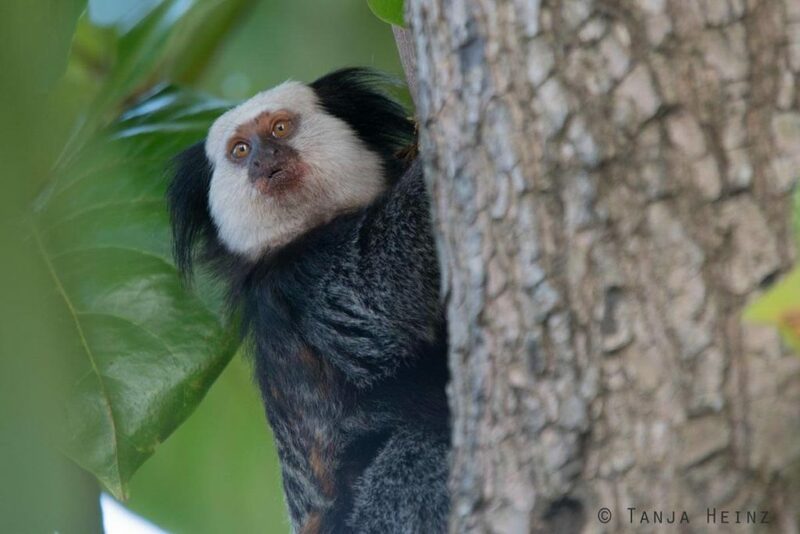 To be more precisely, according to the IUCN the Geoffroy’s marmoset is regarded as ”least concern”. 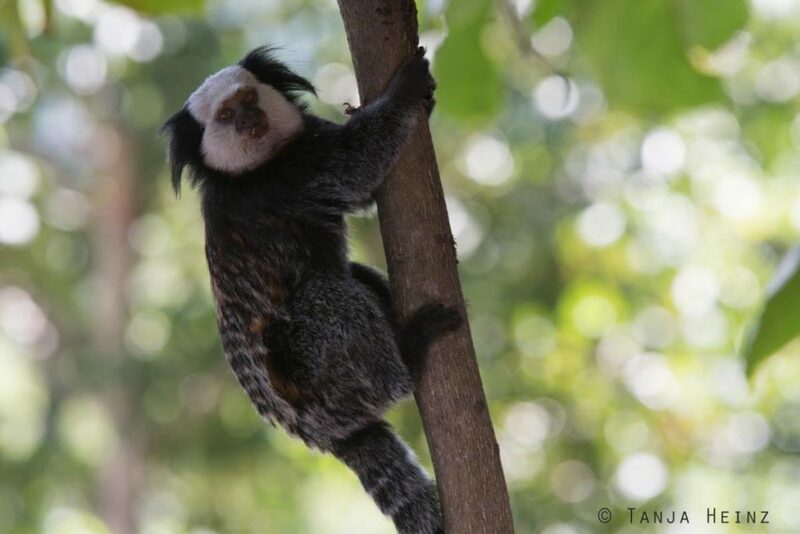 Notwithstanding, Geoffroy’s marmosets are restricted to only a few states in Brazil. That is in Espírito Santo, but also in Minas Gerais and Bahía. 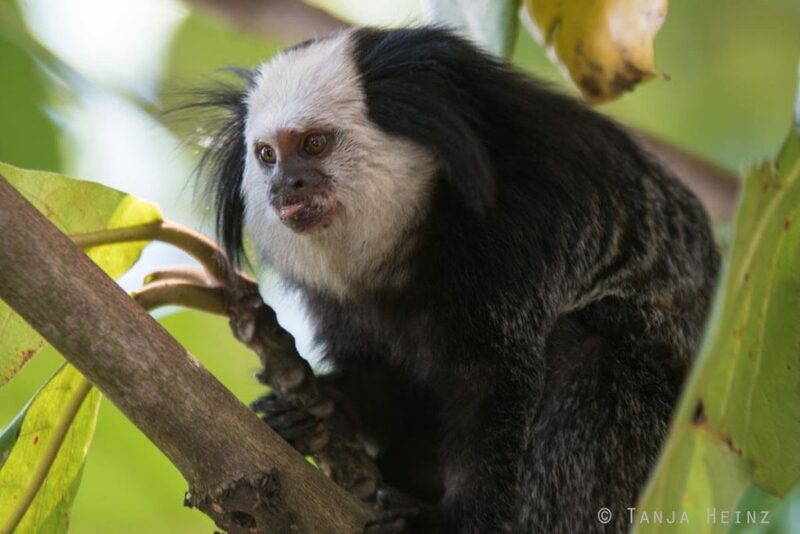 Geoffroy’s marmosets are also known under the name white-headed marmosets because of their white head as the name suggests. 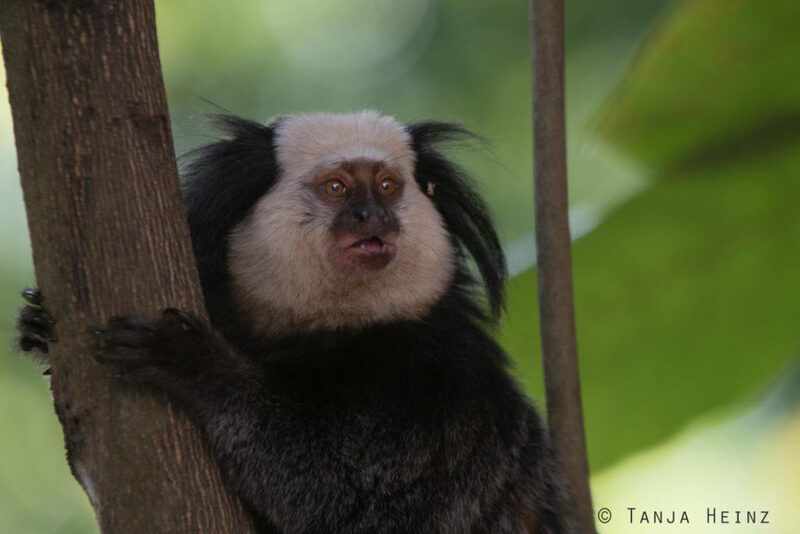 There is one important feature that characterize marmosets like the Geoffroy’s marmoset. Instead of nails they have claws. 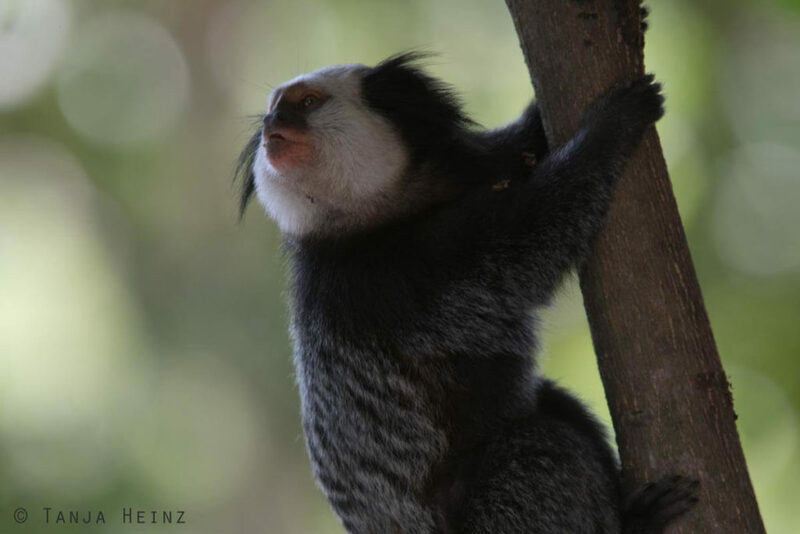 Because of these claws Geoffroy’s marmosets are very agile when climbing on trees. 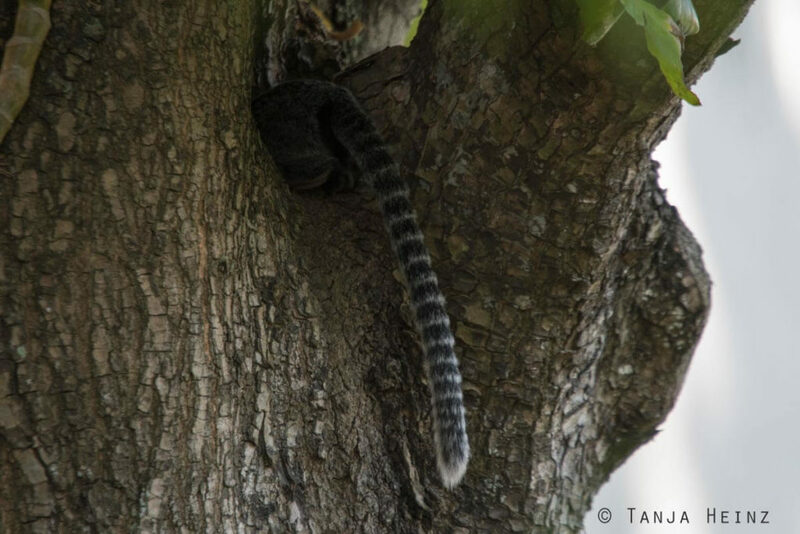 Because of their claws they can climb vertical trunks both up and down. In the course of my journey through Brazil I will meet more of those „climbing artists“. 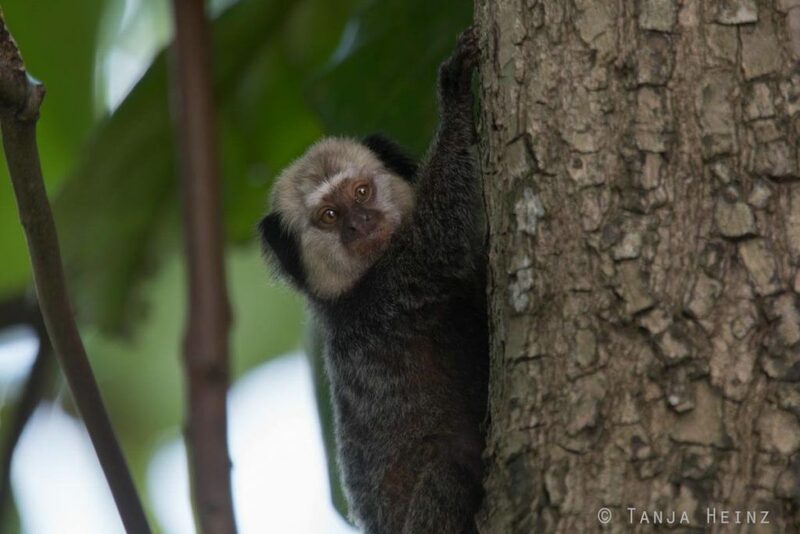 And that is the common marmoset (Callithrix jacchus) at the Sugarloaf in Rio de Janeiro and the Golden lion tamarin (Leontopithecus rosalia) close to Silva Jardim, as well in the state Rio de Janeiro. 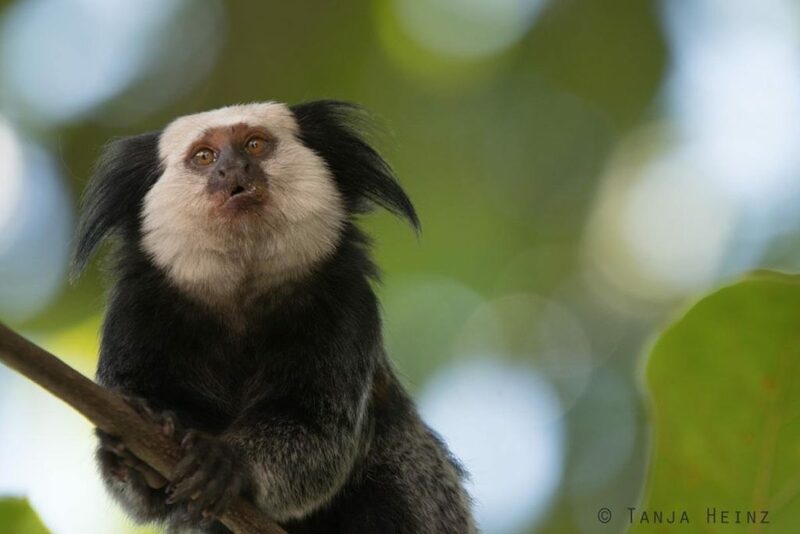 There is another important adaptation of Geoffroy’s marmosets: their incisors. 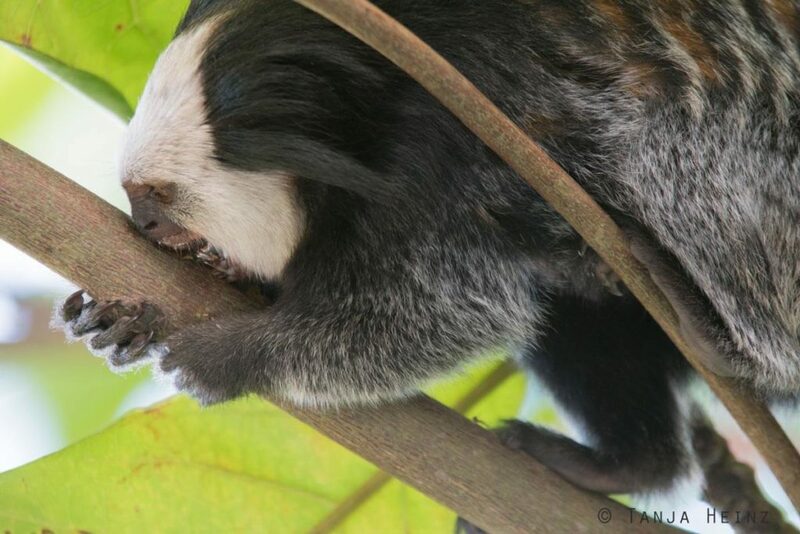 Because of their incisors Geoffroy’s marmosets are able to gouge holes into the tree bark. 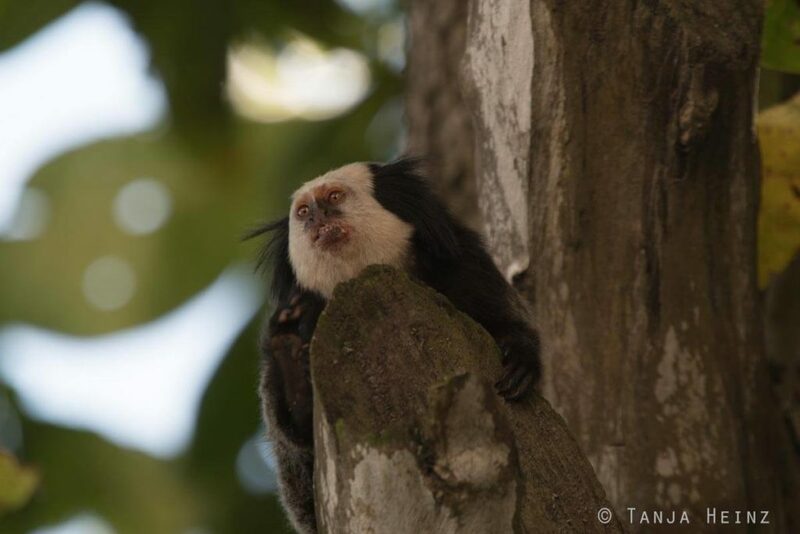 This adaptation enables Geoffroy’s marmosets to feed on gums and tree saps. 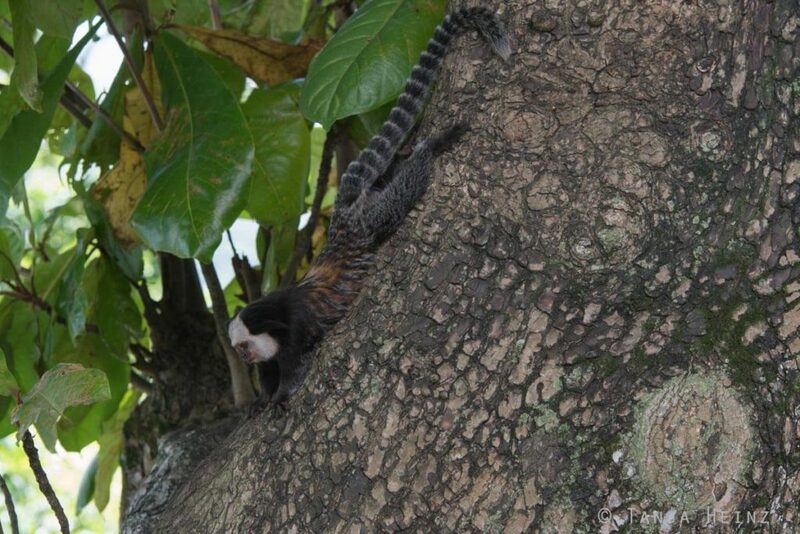 I could observe exactly this behavior – gouging holes into the tree bark – in Geoffroy’s marmosets when I was observing them on the Morro da Penha. … others gouged holes into the tree trunk. 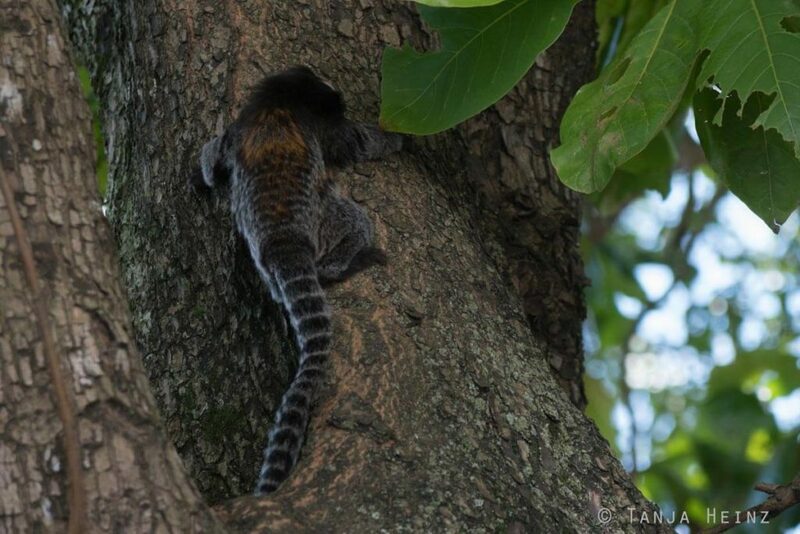 During foraging Geoffroy’s marmosts obviously needed all their climbing skills. 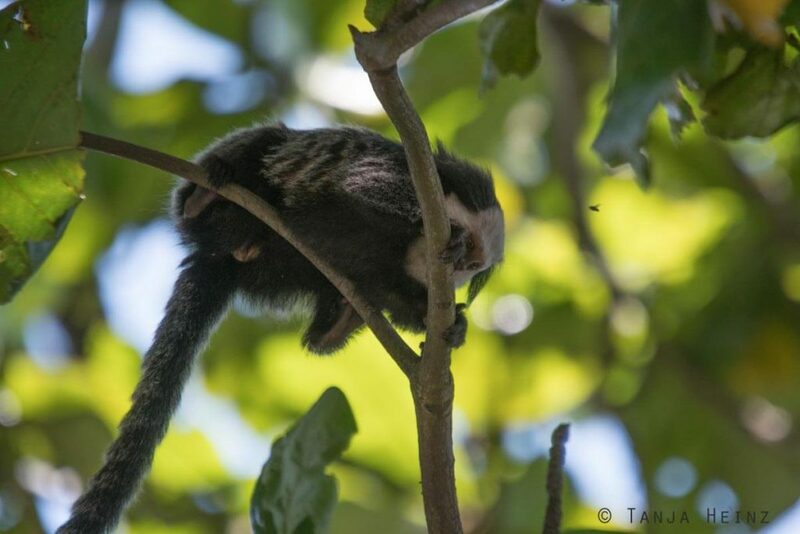 When not searching for tree saps or gums Geoffroy’s marmosets also feed on fruits, flowers or nectar. They are not vegetarians as they also feed on frogs, snails, lizards or insects. Does their behavior destroy the trees? Because they bite into the trees. Rip off the tree bark. What does this mean for the tree? 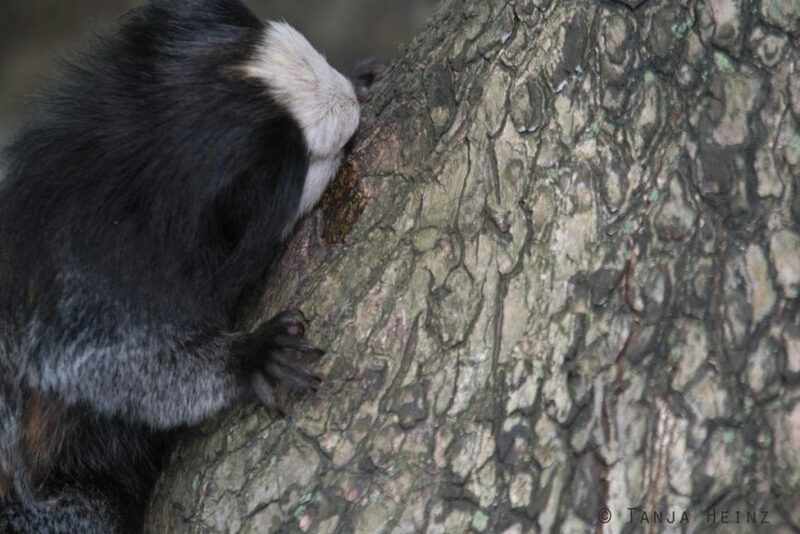 When I was searching for more information about that I came across the two terms “exudate-feeding“ and „tree-gouging“ meaning gouging holes into tree trunks or branches in order to stimulate the flow of gum and tree saps they feed on. 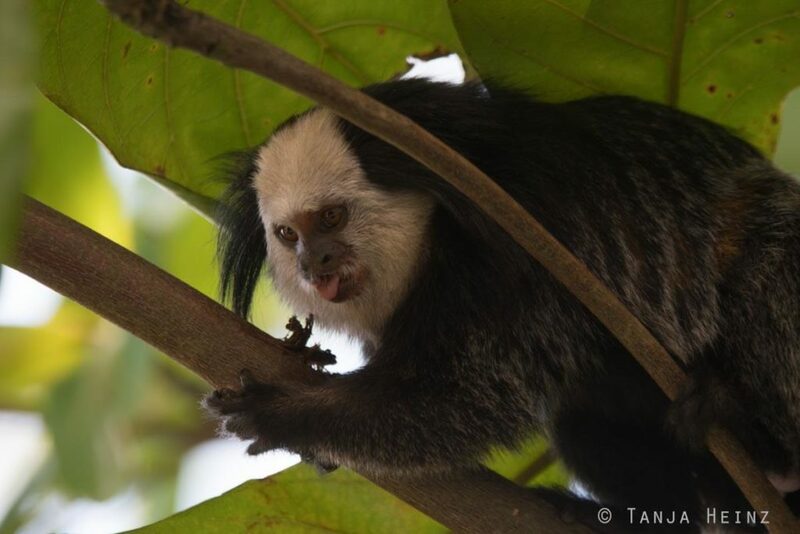 In one study from 1984 (Anthony B. Rylands: „Exudate-eating and tree-gouging by marmosets (Callitrichidae, Primates)”, Journal: Tropical Rain-Forest) I read that this feeding behavior is especially for those species important that are restricted to a small region. And this is definitely the case with respect to the Geoffroy’s marmosets. 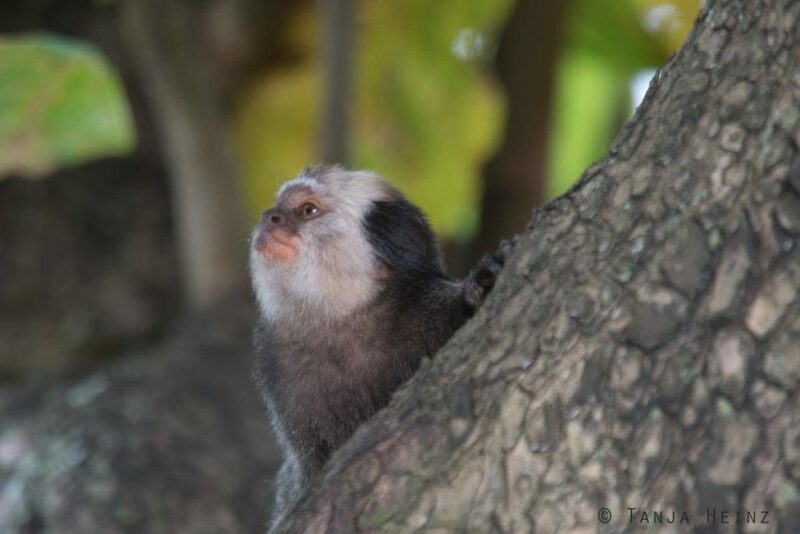 Geoffroy’s marmosets only live in Espírito Santo, Minas Gerais and Bahía. 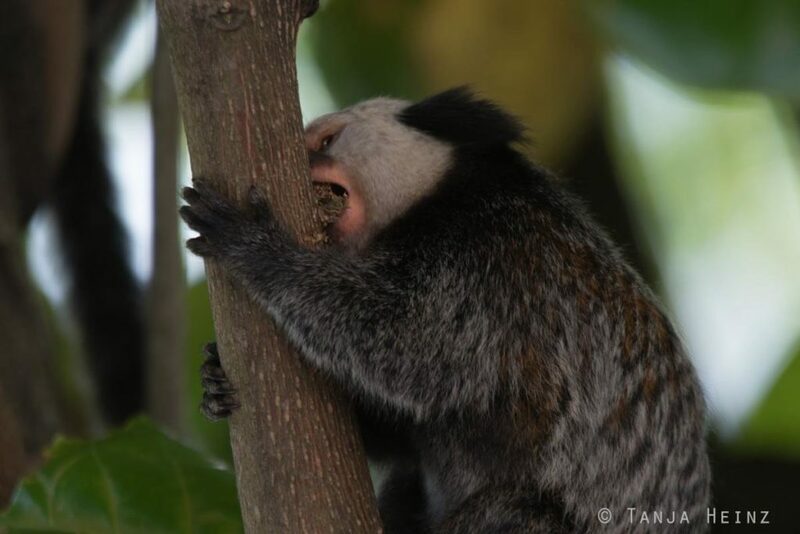 Feeding on gums and tree saps is advantageous for Geoffroy’s marmosets as not all animal species have access to these food resources. 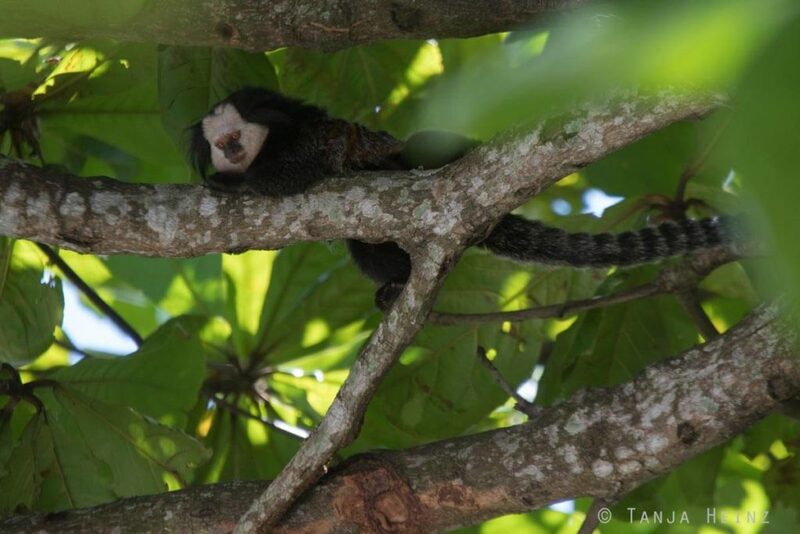 Especially in seasons when fruits are scarce, Geoffroy’s marmosets still have a food resource. I also asked myself, if there is any social hierarchy in the group? During my observations I could not detect any dominant or submissive behavior in any animal. I only observed that not all animals were feeding at the same time. 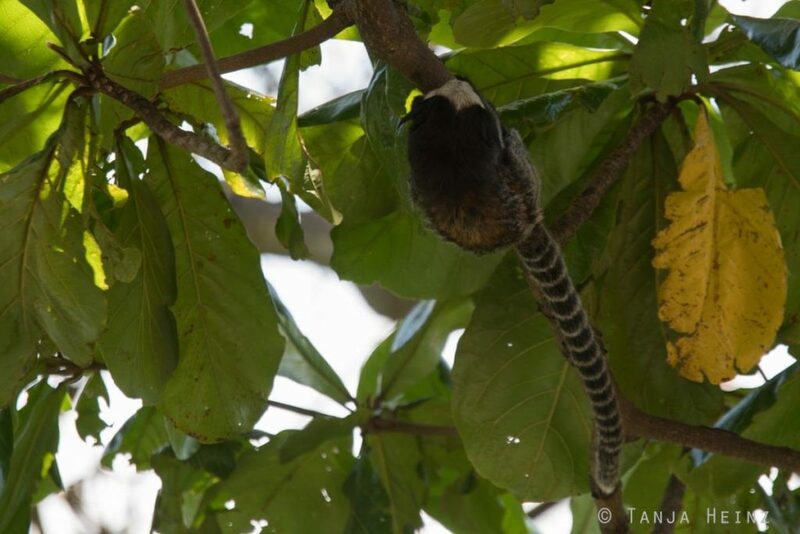 … their conspecifics were feeding in the lower parts of the tree. There was only one animal that appeared a little bit lost. And that was a young Geoffroy’s marmoset. In moments it appeared to look at the adults. In other moments it climbed up the tree. As I could not see bite marks on branches I asked myself if this young has already incisors to be able to feed on tree saps and gums? At least this young seemed to have already claws when looking at its climbing abilities. 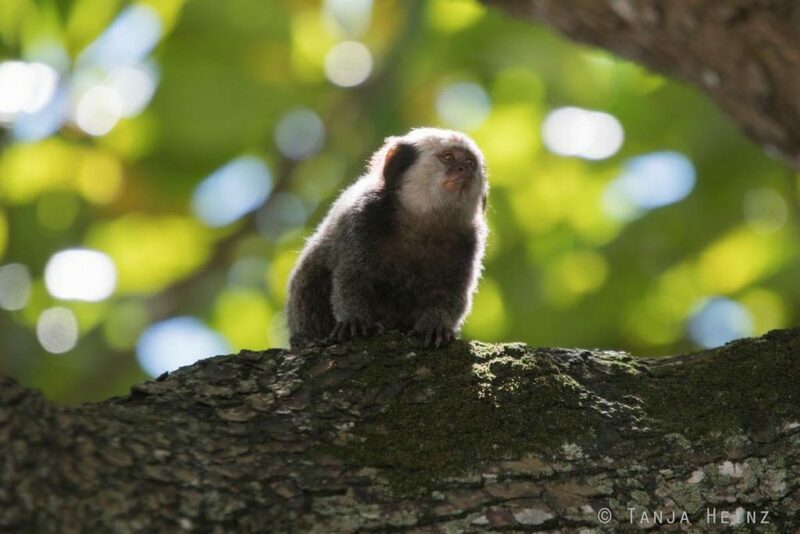 As I was visiting the Geoffroy’s marmoset only for a short time I could not observe them long enough to see how the group was socially organized. However, afterwards I read that Geoffroy’s marmoset are very gregarious and social, and thus, live in groups. The group I encountered at the Morro da Penha consisted approximately of 10 individuals. A group of Geoffroy’s marmosets usually comprises a dominant pair and their offspring. Their offspring usually remain in their natal group until adulthood. There is only one breeding pair in the group. Adult offspring help raising new offspring. If there is enough habitat adult individuals of a group might leave to form a family by themselves. Females usually give birth to twins. 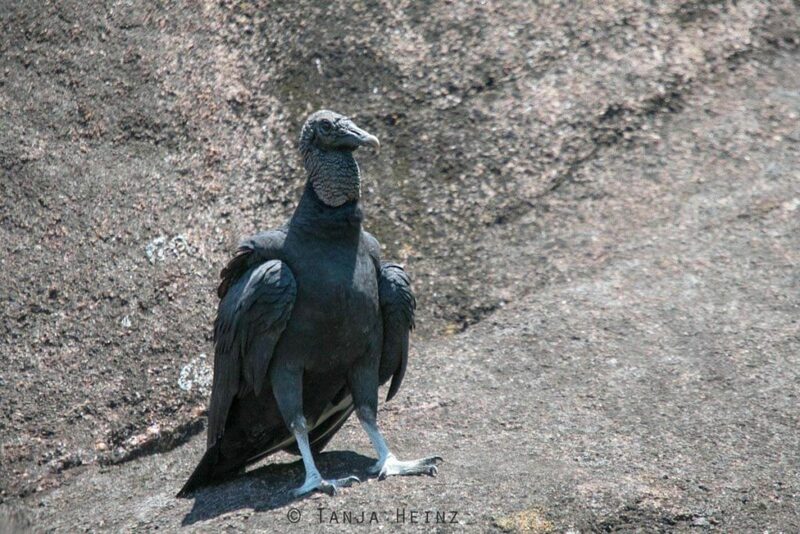 I would have loved to get to know more about these animals at the Morro da Penha. But in that shortness of time it was just not possible. At least they gave me a small glimpse into their life. 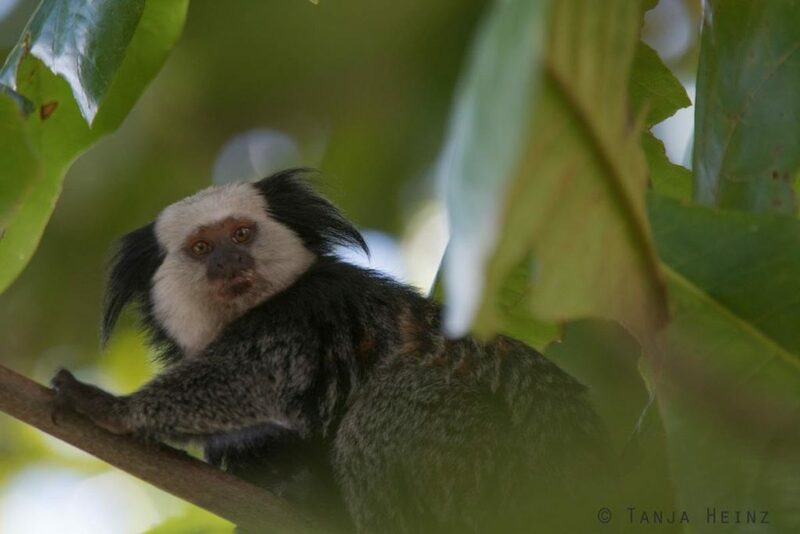 In general, Geoffroy’s marmosets did not appear very shy to me. While I was standing with my camera on a stone stairs under the tree, Geoffroy’s marmosets were moving up and down the tree regardless of my proximity to the tree. 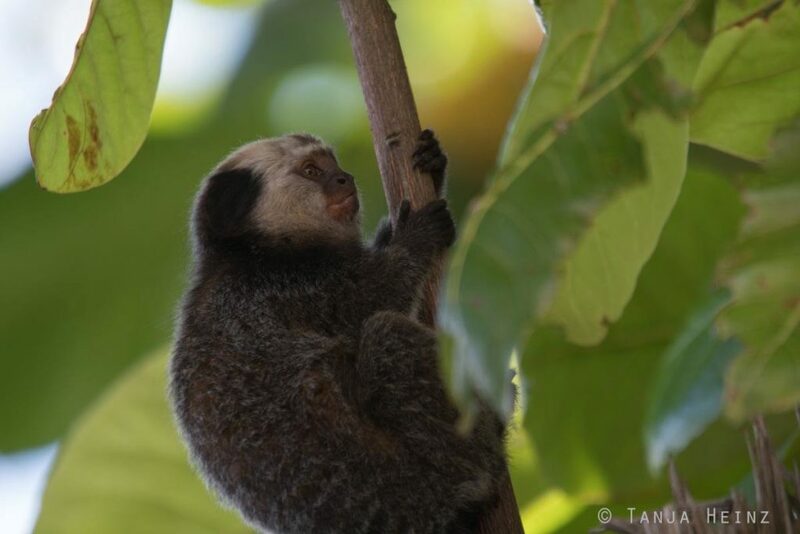 I observed the Geoffroy’s marmosets at midday. 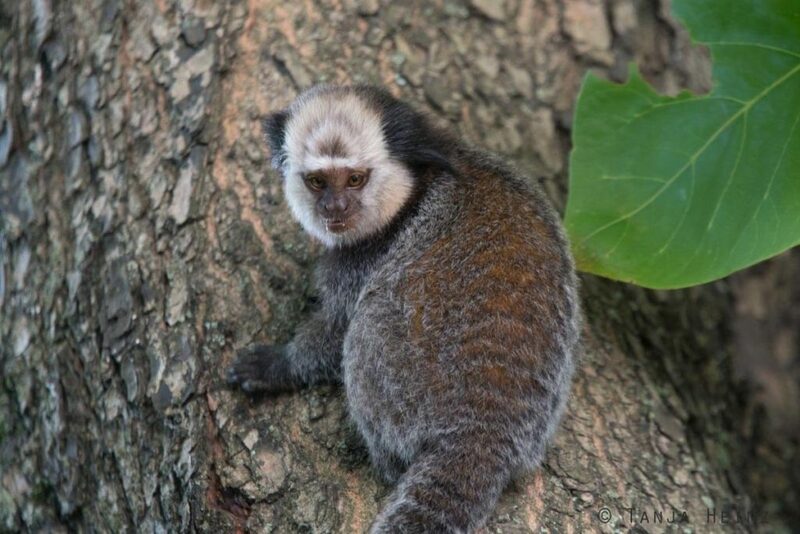 That is not unusual as Geoffroy’s marmosets are diurnal animals. As it was around midday the light was not always perfect to photograph due to the high contrast. 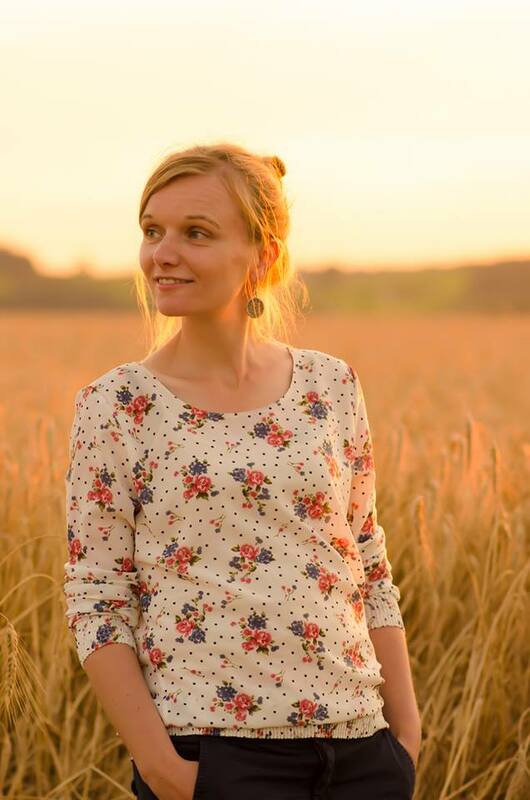 Depending on the position of the animals, in some moments I got a more harmonious background in the photos. While I was standing on the stone stairs observing the Geoffroy’s marmosets, numerous visitors of the Convento da Penha were passing by. 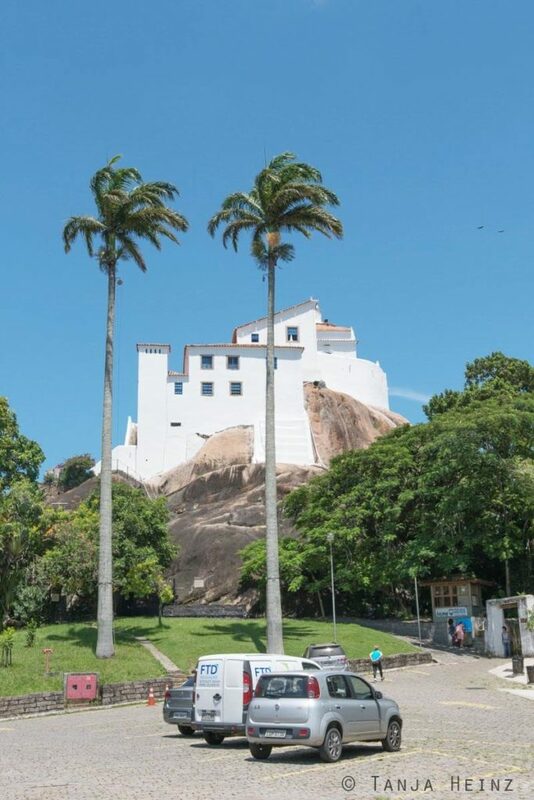 For most people, of course, the convent was the main reason why visiting the Morro da Penha. We were observing the animals on the stone stair that led to the entrance of the Morro da Penha. Therefore several visitors were curious asking us why we were looking into the tree. Of course I was happy to tell everyone about our observations. 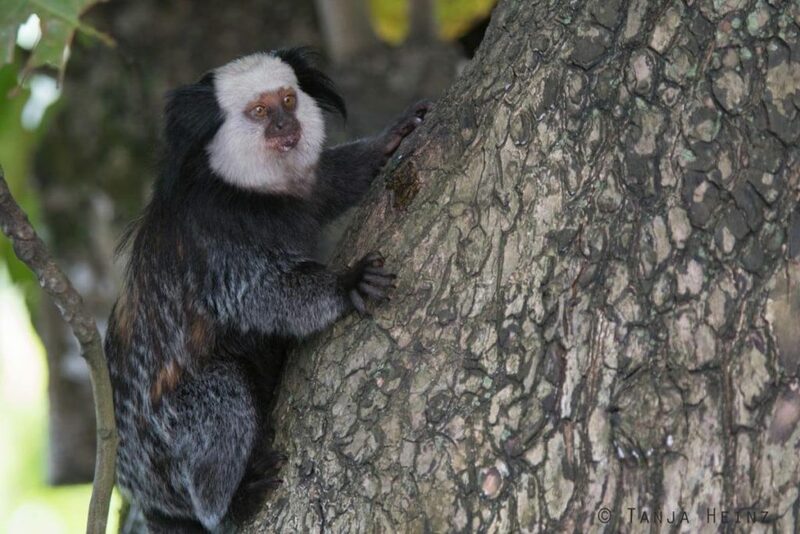 Actually I was hoping as well to meet someone who might know a little bit more than me about the Geoffroy’s marmosets. However, most visitors stopped just for a short moment to take some photos and left again. People either entered or left the convent. Naturally, we also wanted to see the convent after our animal observations. As I did not take any photos in the convent, I cannot present you visual impressions here. I just didn’t feel comfortably taking photographs at a place where people pray. 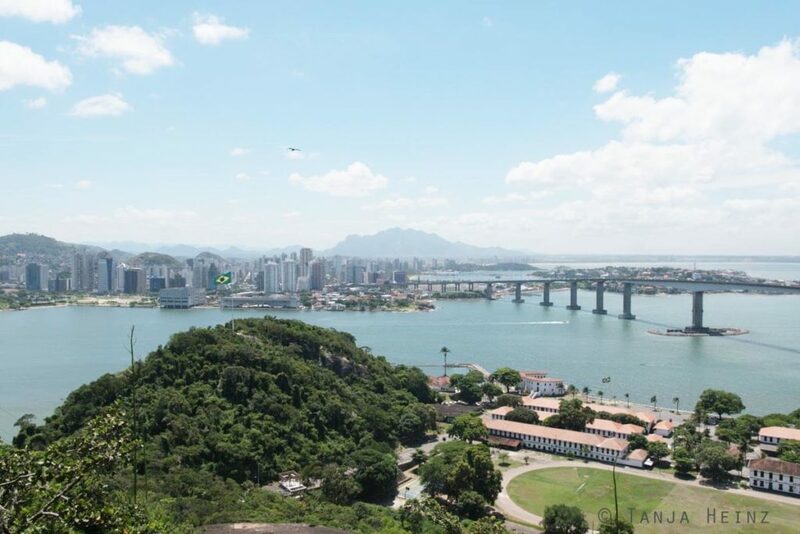 Nevertheless, passing through the entrance of the convent there is a balcony with a wonderful view over Vila Velha. 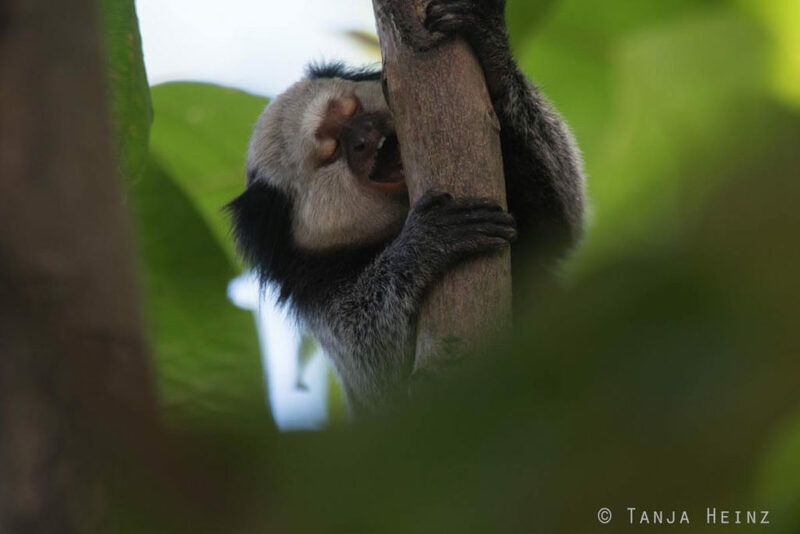 As our next plan was to visit the Projeto TAMAR in Vitória, we left the Convento da Penha and the Geoffroy’s marmosets to reach the Projeto TAMAR within opening hours. Encountering Geoffroy’s marmosets was unexpected on the one hand, but also very welcome for me on the other hand. 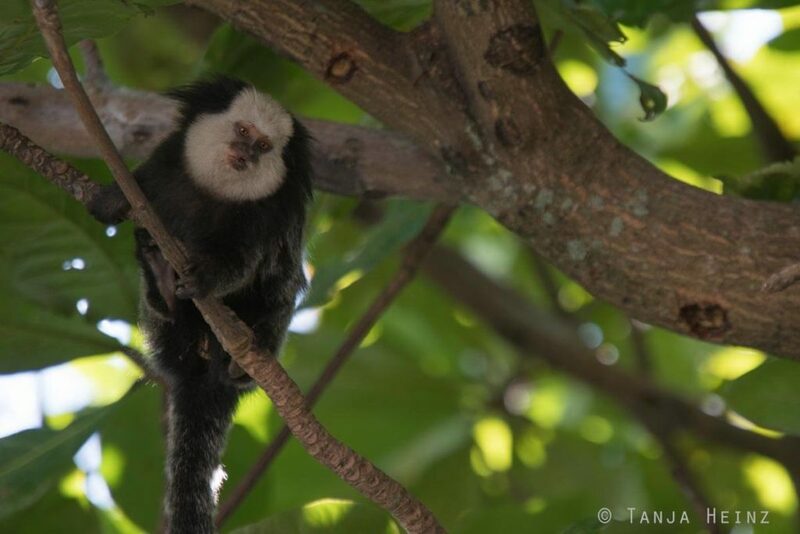 I was especially happy meeting another monkey species that is very typical for South America. I took my time to observe these monkeys. However, I have to admit that still it was not enough time to really get to know the Geoffroy’s marmosets. Where do they sleep? And what size does their range on the Morro da Penha reach? Do the visitors of the Morro da Penha or the convent, respectively, have any influence on their life? Too many questions about the small monkeys I could not answer in the shortness of time. The airport of Vitória Eurico de Aguiar Salles is located in the quarter Goiabeiras which is about 10 kilometers from the center. The airport is not (yet) directly connected with Europe by plane. However, there are regular flights at the airport Eurico de Aguiar Salles within Brazil from and to Belo Horizonte, Rio de Janeiro, São Paulo and other Brazilian cities. Vitória has a modern bus terminal and is very well connected to the Brazilian bus network. The bus terminal is located at the Avenida Alexandre Buaiz, 350 – Ilha do Princípe, Vitória – ES, 29020-300. As we had been before in Linhares to visit the Reserva Natural Vale and the Projeto TAMAR in the Reserva Biológica de Comboios, we took a bus from Linhares to Vitória. We took the bus company Águia Branca. The journey took about 3 hours and we paid 37.15 R$ at the ticket desk in Linhares. It is also possible to buy tickets online either on the website of the bus company or on Clickbus or Brasil by Bus. We booked our accommodation via Airbnb. We booked a room in a flat where a Brazilian woman lived. The flat was located in the street Rua Nestor Gomes, and thus, in the center of Vitória. The accommodation was located in a quiet street close to the place Praça Costa Pereira. The Praça Costa Pereira is more lively than the street Rua Nestor Gomes, but was very close to our accommodation. Several busses leave at or close-by from the Praça Costa Pereira (depending on the bus). When we arrived in Vitória we took a taxi to our accommodation from the bus terminal to the street Rua Nestor Gomes. We arrived late on that day at around 9 p.m. at the bus terminal. Although the bus terminal was not far away from our accommodation we took a taxi as it was already late and because we still would have needed to search for the path to our accommodation. Furthermore, the streets of Vitória were unusually quiet. Therefore, we took a taxi. We felt safer by taking a taxi. Fortunately the taxi driver had a taximeter. I recommend negotiating the price before a drive if a taxi has no taximeter. When we visited the Morro da Penha we took public transport. However, there was no direct bus to the Morro da Penha. At first we drove by bus from a bus station close to the Praça Costa Pereira to the terminal Vila Velha. The bus line 500, for example, drives to the terminal Vila Velha. After that we took the bus line 635 to Prainha where we got off to visit the Morro da Penha.